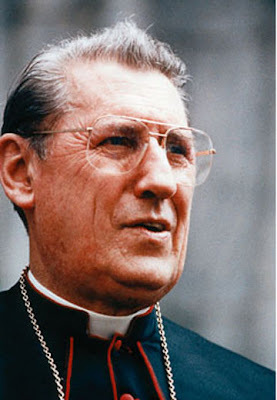 Six weeks before the tenth anniversary of his death, the legacy of the Stateside bench's last household name -- Gotham's John Cardinal O'Connor -- will be the focus of a 27 March conference at Dunwoodie. Archbishop [Timothy] Dolan will speak at 10 a.m. on "Cardinal O'Connor: Priest and Churchman for Our Times." Mother Agnes Mary, S.V., superior general of the Sisters of Life, will give the closing conference at 2:30 p.m., "The Spirituality of Cardinal O'Connor." Speaking at 11:15 a.m. will be Helen Alvare, professor at George Mason University School of Law and past pro-life spokeswoman for the U.S. Catholic bishops on life issues. Her topic will be "Cardinal O'Connor: Leader and Servant of the Truth." The event is sponsored by the archdiocesan Family Life/Respect Life Office. Registration will begin at 8:30 a.m. and Mass will be celebrated at 8:45 a.m. Even now, the goldleafer's son from Southwest Philly remains in a class by himself. May his words and example never fade from our midst.